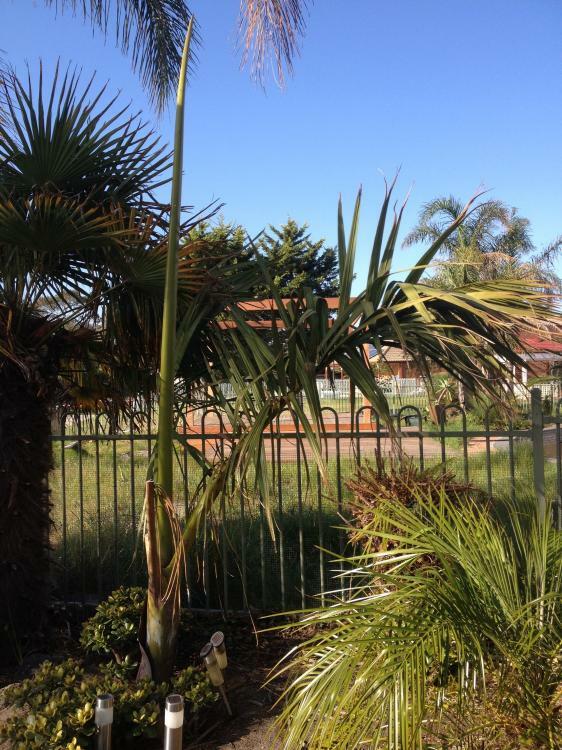 Steve99 there is people who post here that even have amazing collections of palms in Hobart its all about choosing the correct palm species suited to the climate and providing the best conditions possible. ha ha..guessing Coops is Mark…I (Mick) can't comment on odd ball marginal species in Vic I will just let guys like you push the boundaries. BTW. full sun for sure with that foxy lady, a spot protected from cold West winds if possible even better if you can plant near some thermal mass like a brick wall or concrete path. There are a number of experienced growers here on Palmtalk that have (or have had) some of the more exotic species growing in Melbourne. Hopefully some of them might chime in on this thread with their personal experiences. 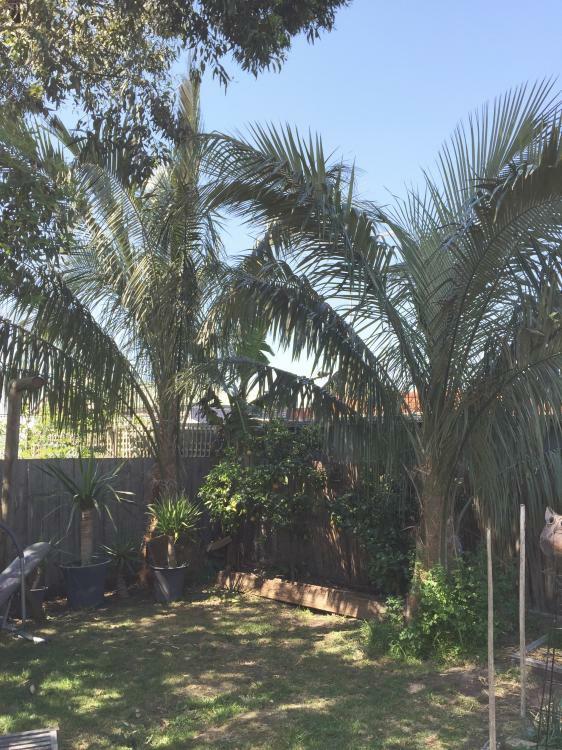 Melbourne's climate is real tough on most species of palms - a long cool winter (effectively 5 months this year) that will kill off a lot of palms, and then the potential for 40 degree plus days over summer that can fry those palms that coped with the winter. Also, Melbourne has a large geographic spread with different "microclimates" in many areas. EG the beach side suburbs offer the more moderate microclimates - toward the Dandenongs is going to be more challenging. 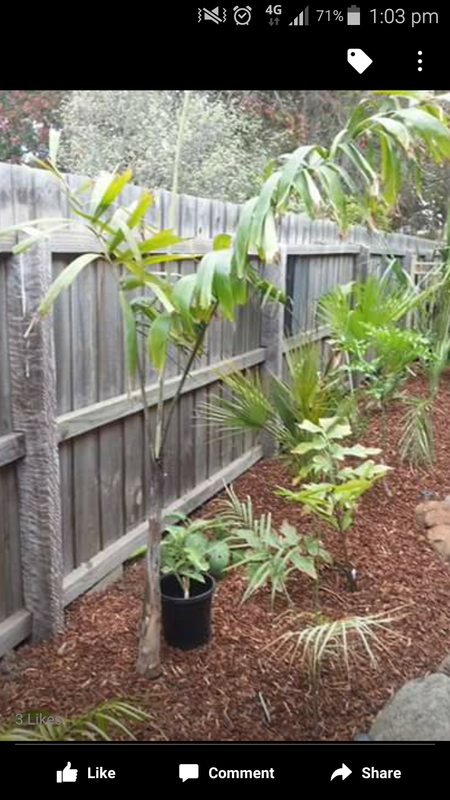 I have had a crack at growing some of the more tropical species with mixed results. Also I protect some of my palms during winter, some are in a plastic glasshouse, and some are in my garage with some heating. 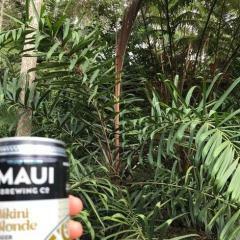 You should try also Wallichia disticha, I live in a climate even more adverse than this of Melburne and nevertheless it grows for many years, slowly yes but also reliably! Coops 3214, the Cryosophila is about half a metre. From a 175mm pot. I've got a foxy lady that gets filtered sun and is sheltered by a large Sabal palmetto. It is about 3m tall now but quite slow. I think it would be faster in full sun but that shelter also protects it from the cold. 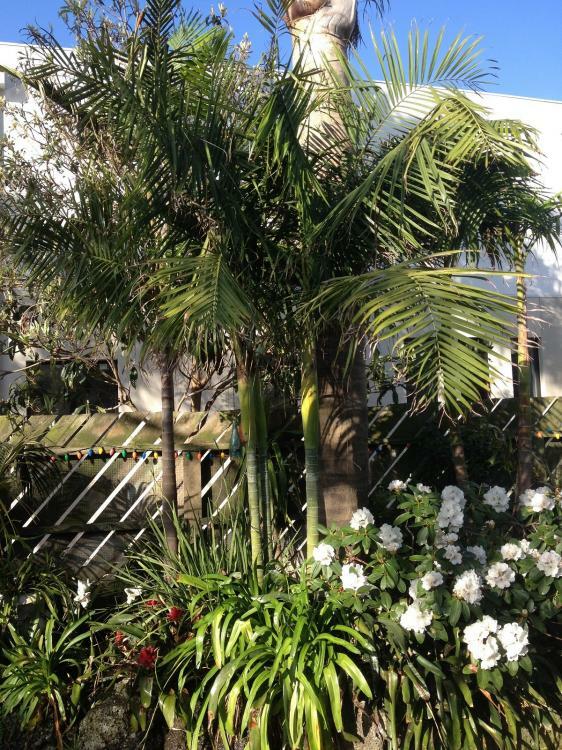 New Cal palms that do well for me are Chambeyronia, Cyphophoenix elegans, Kentiopsis oliviformis and I've also got a Kentiopsis magnifica seddling that has breezed through the last couple of winters. In terms of palms that are marginal or struggle, I've seen a couple of long term survivors of Wodyetia however they don't look good. I've failed with Roystonea regia, Hyophorbe lagencaulis and vershaffeltii, Ptychosperma elegans and macarthurii and Pinanga coronata in the past after they held on for years before eventually declining. The struggle seems to be the extended cool period from May-September without enough heat to sustain these tropical species. 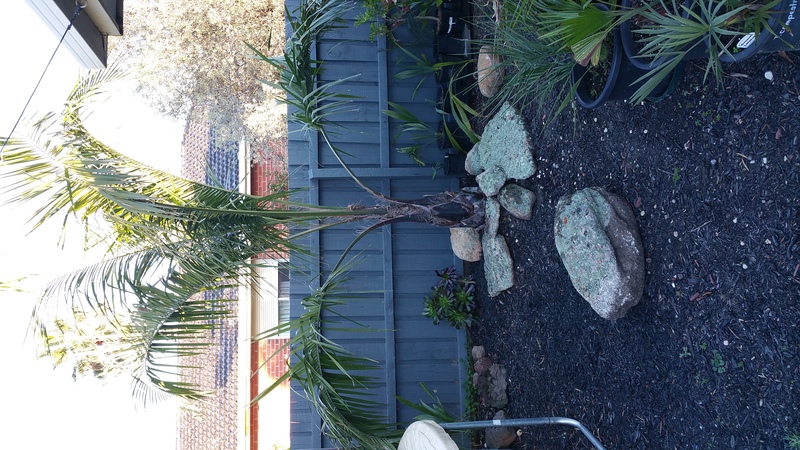 I planted a decent 250mm pot size one last summer and of all my palms this winter it was the only one that got true cold damage. BTW did you ever try Basselina gracilis? Has anyone ever tried a D. decaryi X D. leptocheilos? Triangles seem to grow fine in the right spot down here, rednecks a bit marginal, but generally hybrids have a bit more growing vigour and even sometimes tuffness, if you could get a cross where the triangle is the mother plant (holds the seed) hence normally more traits from the mother plant then you would expect it could be a possibility. @ gob1 Of all your Chamaedorea sp which one grows the best for you or looks good at the end of winter? I planted a Chamaedorea klotzschiana last summer and its been a real good grower and went through winter fine and still in pretty good nick and nice and green was kind of surprised how well it did seeing this winter gone was quite a cold one and its had little time to establish itself that compared to my standard cascades that have been in for years a few feet away can sometimes get a bit ratty tips going brown. Also got C. radicalis trunking form but only just planted it in ground this week. 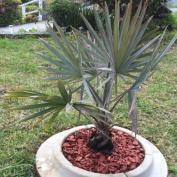 EDIT: I just saw a pic of some of your Chamaedorea sp, they look in pretty good nic. All grow well, maybe the tenallas are more sensitive. I had 6 ernesti seedlings in the ground over winter and they actually kept growing! Aside from amabilis, sullivanorum and tuerckheimii I don't think there are many other chamys that rock my boat. Coops - the garden where I've grown most of my stuff is my parent's place in Patterson Lakes but I've recently moved into my first home in Bonbeach just around the corner which is just has space for a small garden but I've still managed to squeeze in Beccariophoenix alfredii, Dypsis ambositrae, Syagrus sancona, Hedyscepe, Chambeyronia, Cyphophoenix elegans, Archontophoenix myolensis, Rhopalostylis sapida, Pritchardia hillebrandii, Chamaedorea nationsiana, Lytocaryum weddelianum, Kentiopsis magnifica, Burretiokentia hapala and Cyphophoenix alba. I planted everything a week before the two harsh frosts we got in mid June (maybe a mistake), so the Burretiokentia, Cyphophoenix alba and Pritchardia all took a hit. They are recovering now however and everything else is looking strong. 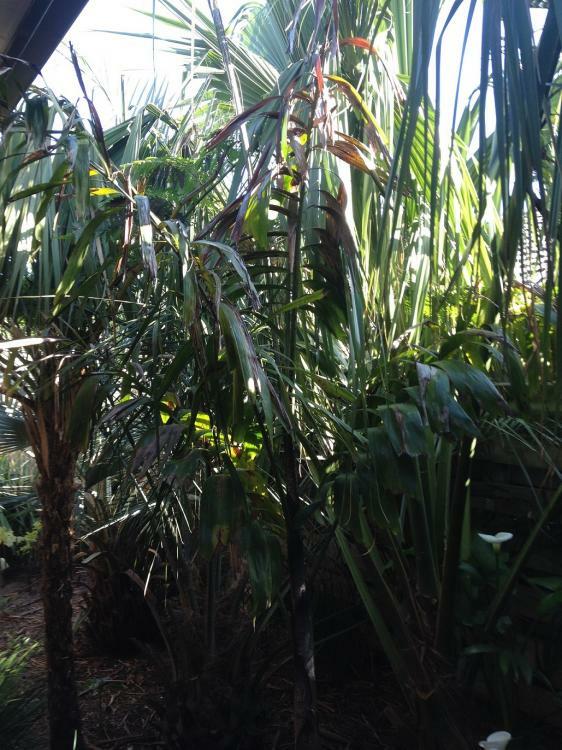 The S. palmetto must actually be about 5m tall to the top frond (shelters the foxy lady which has a few rings of trunk and is about 3m tall) - from memory the Sabal was planted around 2006 as a small seedling so it grown quite quickly and robustly, I'd recommend getting yours in the ground asap. In that garden everything has grown well, there is a Brahea armata, Jub x Butia, S. palmetto, S. Mexicana and Ravenea glauca all side by side and all getting very large. Its actually difficult to take photos of that garden now but I'll try to grab one next time I'm around there. Mick, before my current Burretiokentia hapala I did grow one for years. Very slow however it was happy for a long time...until a falling S. rom frond crushed it and it never recovered. I did try a B. gracilis once - lasted a few years as a seedling before its slow decline, I probably neglected it and let it dry out to frequently. Also tried quite a few B. glabratas but they seemed to have that sudden demise that randomly affects some palms such as I've experienced with Lepidorrhachis in the past. For what its worth, D. decaryii are popping up all over the place locally now, some getting quite large. There are actually a couple that are flowering in Seaford just South of me so they seem to do well in Melbourne once established. I've never seen a D. leptocheilos survive long term however - there was one at a local nursery that held on for years but always looked terrible before eventually succumbing. I've never tried the hybrid but have always wanted to give it a go, I'm sure it would do well here. By the way, my favourite Chamaedorea for here is tepejilote as long as it is protected from full sun. Yes indeedy. 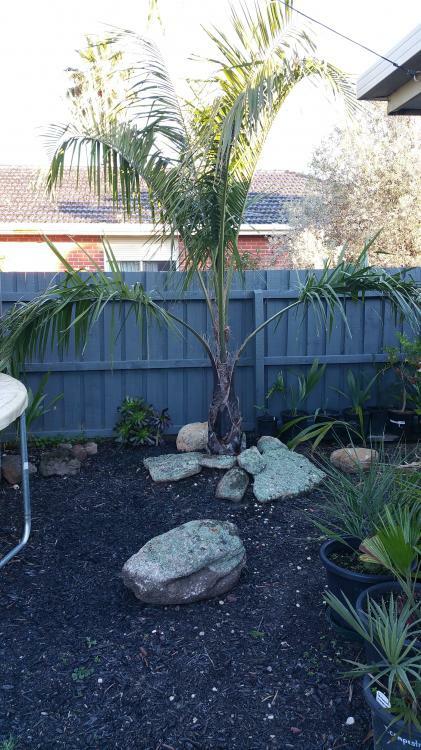 I've been growing palms in Melbourne for 15 years. About 80 species these days, most in ground and many quite substantial. these are my Parajubaea torallyi v torallyi. Fifteen years old from seed! How do u post pics?? Botanical garden in Melbourne is growing lots of palms as well. They amazed me as well when I visited the "cold" city of Australia. 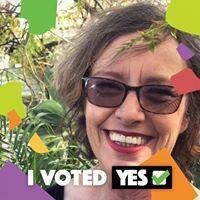 Awesome Jo! I've got a couple of Parajubaea cocoides from seed not quite as old that aren't nearly as impressive. Toralyii is the nicer palm imo. To contribute to the Melbourne oddball collection - Wodyetia x Veitchia arecina. 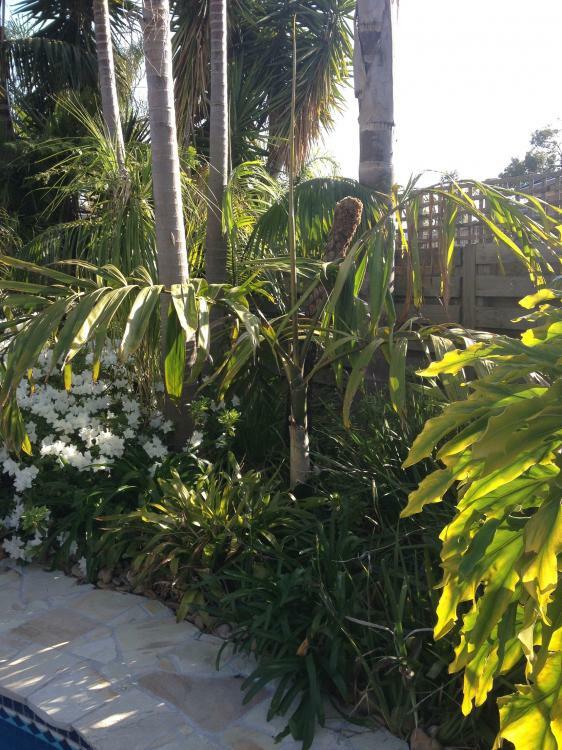 Not a great photo, difficult to take in this garden with the size that a few palms are getting to. It has a few rings of trunk now and the top of the spear must be approaching 3m (10') - compare to 2.4m awning. Rhopalostylis baueri - has moved at a similar speed to most Archontophoenix (Howea f trunk in foreground). Chambeyronia macrocarpa - a few rings of trunk now and throws 1-2 red leaves / year. Dypsis decipiens - a bit battered from recent renovations, a lot of dust and not much water for the last year. But the new spear is growing strongly and is 2.5m+ at the top. That garden is going great tim looks great, how old are those plants?? 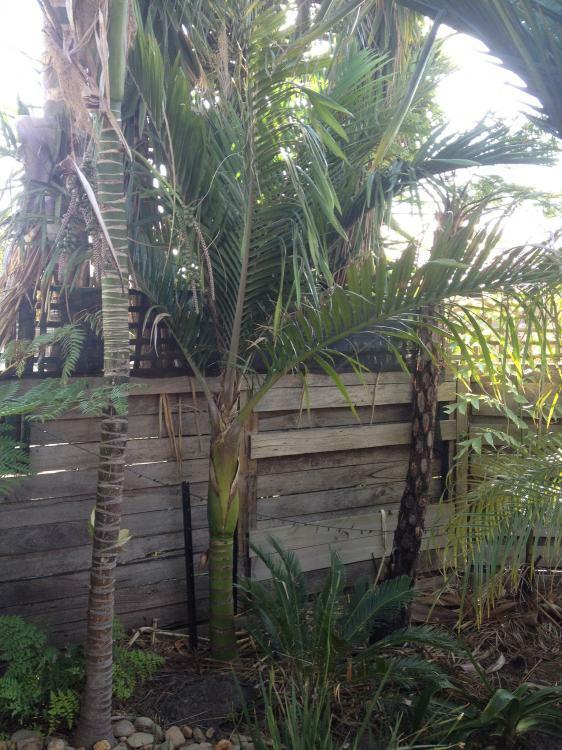 That dypsis is awsome how old and how big was it when u planted it?? The dypsis decipiens and baronii were planted at the same time I think in 2008. Both I'm pretty sure from 200mm pots. The two baronii stems on the left already had a few rings of trunk, while the one on the right (now the largest) was just a small offshoot. Both my Hedyscepe i planted end of last summer have a little burn but I've planted them in a bit too much sun but those areas will shade up more with time, plus i want them to grow with that robust look like Tims in Tassie BTW they are growing very steady both have pushed out two fronds in less than 10 months. My kentiopsis is under shade cloth most of the day but gets arvo sun and has got just a very slight burn on one frond, seem tougher to sun than Kentias though. Ive been watering heaps on those hot days morning and arvo my soil tends to retain moisture pretty good. I've had 2 K. oliviforrmis planted in mostly shade for years which have never really grown - from the reports it sounds like they might do better with a bit of extra warmth and exposure to the sun. My K. magnifica seedling planted out in partial morning sun seems to enjoy it so far. My Hedyscepe's are getting a little crispy but it's their first summer planted out with any direct sun so I'm hoping they adjust and should also get more relief in the future when other's grow around them. My Ceroxylon ventricosum has been really battered so I've put up a makeshift shadehouse, its still growing but looks pretty bad - FYI for all you Melbourne growers out there avoid planting Ceroxylon in full sun here - rookie mistake on my part. On the other hand Beccariophoenix alfredii and Archontophoenix myolensis are loving it, even at seedling size.